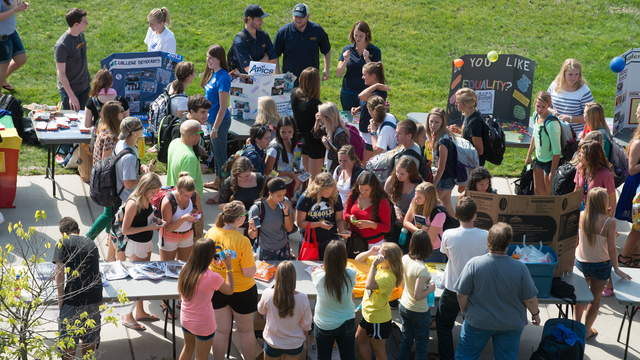 Did you know there are more than 220 student organizations at UW-Eau Claire? Some of these are closely tied to a major, like the Philosophy Club or Aspiring Educators. Scholastic organizations like these will expand upon your classwork and connect you with individuals who share common goals. UW-Eau Claire also has student organizations for sports, games, spirituality, cultural identity, political action, Greek Life, honors, language studies, music, community service, and so much more. When you feel like stepping beyond the scope of your major, browse the official list of student organizations and see where curiosity can take you. Student organizations at UW-Eau Claire range from the academic, professional and political to the spiritual, cultural, creative and athletic. However, this should come as no surprise — the students at UWEC are imbued with the Power of AND! There are performance organizations such as Audacious and Fifth Element, cultural organizations such as the Chinese Students and Scholars Association and the Hmong Student Association, recreational organizations such as the Billiards Club and Curling Club, organizations for social workers and journalists, veterans and photographers...and the list goes on and on! Search the complete UWEC student organization listing to find out what you might want to get involved with, and, if nothing peaks your interest, request to start your own student organization! As a student at UWEC, diversity of choice is your prerogative. BluSync will provide you with a brief description about each student organization, its goals, as well as contact information for the organization president and/or member who can tell you more! Come Find Your AND today with UWEC student organizations! Here at UWEC we offer a wide variety of clubs and organizations for students to join and participate in. Take a minute to browse our selection to find the perfect fit for your time on campus.